Today, Sat., Dec 4, 7-9pm! With each paid entry you get 1 raffle ticket that will put you into a drawing for gift bags from Toes on the Nose, Hianano swag, XM Surfmore leashes & tail pad, Swell.com and Duke's restaurant gift cards, SHF logo items and more. Due to limited seating, your chances of winning are very high! Taking the viewer to the birth of big wave surfing in the early 1950's through the short board evolution, it is a heart rendering journey that reminds us that some things can never be taught...only remembered. Composed of historically precious footage that has not been seen in years, the film Wake unto Blue, brings us the surfers who shaped and forged the sport into what it is today. The book, Increments of Fear is the story of the human endeavor for perfection, and the failures intertwined in the journey. 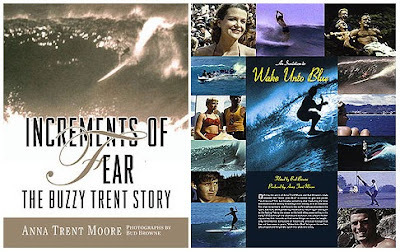 Poignant, brutally honest, and provocative, it sheds insight into one of surfing's most intriguing and charismatic characters, Buzzy Trent. This event may sell out, we only have seating for 100 so be sure to order your tickets early!